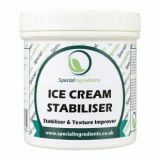 Our Ice Cream Stabiliser will stabilise and improve ice cream and milk ice. It can be used in all kinds of preparations with a fat content between 4 - 14 %. Imparts smooth, creamy and fine texture. Makes ice cream easier to scoop. Prevents and delays the growth of ice crystals during storage. Stops the shrinkage of a finished product. Imparts excellent air distribution and stable overrun. Increases shelf life of finished product to 24 months. Dissolve dry blend into milk or water at 65C. Add all the other powders and rest of melted fat. Cool to 4C. <;o>Whip and freeze. Locust Bean Gum (E410), Fatty Acids (E471), Guar Gum (E412), Sodium Alginate (E401), Agar Agar (E406). Works well with Dextrose and Milk Powder. 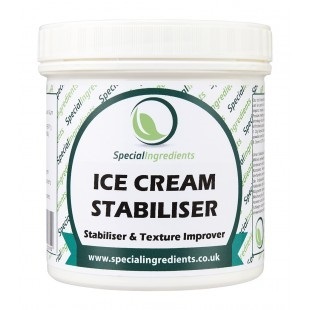 1) Dry blend stabiliser with sugar.